It is my pleasure to report that the Society’s 21st Biennial Meeting, held on June 9-11, was a great success. 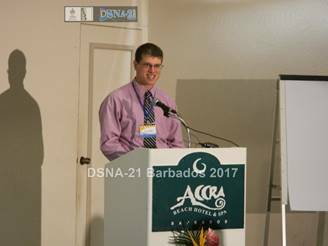 The conference left the North American continent for the first time, venturing to the beautiful island of Barbados. The tropical setting provided a lovely backdrop to a slate of papers that was among the most diverse and interesting in recent memory. There was a strong focus on Caribbean lexicography and lexicology from scholars within and outside the region, complemented by varied presentations on all areas of dictionary research. The 50+ attendees travelled from Singapore, Spain, the UK, Slovenia, Italy, Trinidad, Suriname, and of course, Canada and the US. A cocktail hour featured local music and cultural performers, and the sumptuous banquet included outgoing President Luanne von Schneidemesser’s address about her early days working on the DARE project and also performances by the Catchwords. The conference also introduced some new elements, including the Five-Minute Lexicographer – a series of short presentations on works in progress by DSNA members and students of lexicography at the host institution, The University of the West Indies, Cave Hill Campus (UWI) – and the Richard Allsopp Memorial Lecture – a new UWI tradition honouring the great Caribbean lexicographer and long-time DSNA member – delivered by Mevr. Dr. Renata de Bies of the University of Suriname. None of this would have been possible without the work of a wonderful local organising committee – Hélène Zamor, Romel Springer, Krista St Juste, Alison Johnson, and Jeannette Allsopp – and the support of our generous sponsors and advertisers, including UWI, Merriam-Webster, Duke University Press, the American Dialect Society, Oxford University Press, Accra Beach Hotel, and the Barbadian Ministry of Culture, Youth and Sports. A great debt also goes out to Luanne von Schneidemesser, Steve Kleinedler, Lise Winer, Ed Finegan, Ron Butters, Rebecca Shapiro and all the other members of the DSNA who guided me in my first conference organisation. It is my sincere hope that this is not the last time we’ll see the DSNA outside of the North American mainland. Here is a link to many photos taken at the Conference.